Even shadows have vanishing points, but these may not correspond directly to the standard construction vanishing points or horizon line. Shadows have their own vanishing points which are called light vanishing points or shadow vanishing points. To create believable shadows one must first draw an object in a transparent way. This is because you will need to know where the back corners are in order to finish a shadow which may disappear behind the object. Then you find the light source in relation to the object. You may want to check to make sure that you are placing it in the proper position, otherwise there will be distortions. You then create a vertical line descending directly from the light source or light vanishing point until it intersects with the surface where the shadow is being cast. This point will be your shadow vanishing point and shadows will radiate out from this point. Send light convergence lines through all top corners of the object (some may end up inside your object). Then send shadow convergence lines through all the corresponding bottom corners until they intersect with the light lines. This will mark the extreme edges of your shadow. Light radiates out in all directions. If you have a light source directly above an object, then your object will cast shadows in all directions. Shadows can be cast on a number of surfaces. 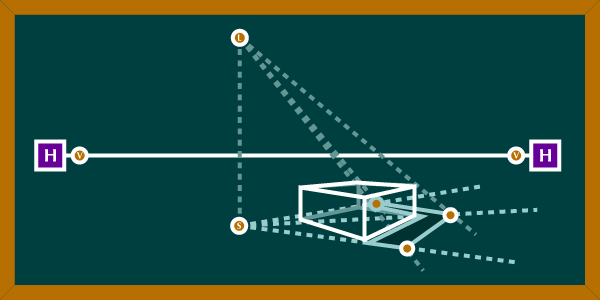 For instance, if you have an object sitting on a table, then there will be a different shadow vanishing point for the object (which will be on the tabletop) and for the table (which is on the floor). When the light source is the SUN or MOON, the shadow vanishing point is on the horizon directly below the light source.